We’ve all been there. You’ve been too busy (or just too lazy), or the weather has been too bad, and you’ve neglected your garden. Now it resembles something from a Tarzan movie and needs to be tackled. So, after spending hours cutting, trimming, and whatever else needed doing, you now have a nice looking garden again. Only one problem- there’s now a mountain of garden waste at the bottom of your garden for you to dispose of. So what do you do? Option number one: You now spend even more time bagging up the waste and doing several trips to the tip and back. I don’t know about you but the tip is one of my least favourite places, and not having to go there would be worth a king’s ransom in my book. Option two: You make a big bonfire and burn it. Now while this is far more pleasing to the ear for me than going to the tip 20 times, it is still quite time consuming as you have to not only build the fire, but also stand and keep an eye on it so it doesn’t spread or get out of control. Also, in this day and age, we all have to be more environmentally conscious and the smoke and fumes going out into the air is probably not the most ‘go green’ option you can choose. Not to mention how much it will annoy your neighbours if the smoke from your fire blows over their fence and onto the clothes hanging on the washing line. Option three: You invest in a garden shredder. I know, when a lot of you hear someone say garden shredder, you imagine what you see in the movies- a huge, bulky metal contraption making so much noise it could raise the dead. However, this doesn’t have to be the case these days. With many top electrical and engineering brands competing for their market share, there are now hundreds of different models available, coming in different sizes, at different prices and with differing features. On this page, I’m going to try my best to share my knowledge of garden shredders with you. I’ll explain the different types, their pros and cons, what garden shredders are best for certain jobs and offer up a selection of hand-picked reviews for you. I hope by the end of this article you have a greater understanding of what is available when it comes garden shredders. Let’s start with a general idea of the benefits and drawbacks of using a garden waste shredder. They save you the bother of travelling down to the tip to dispose of your waste. They produce mulch that you can spread around your garden to help fertilise and improve the quality of the soil. You can produce compost much faster with a garden shredder and also compost of a much higher quality and richer in nutrients. When making compost with a garden shredder, the temperature is high enough to kill weed seeds, so when you use the compost in the future, you won’t be contaminating your garden with them. You have to be careful of chippings flying around. For safety reasons, most household shredders have smaller inlets than commercial models and this makes the task slower, and requires a bit more pre-planning and elbow grease. For example you might need to use garden shears or a chainsaw to cut larger things down such as bushes before inserting them into the shredder. There are two types of garden shredder for general, home use. The impact shredder (also known as rapid shredders) and roller shredders (sometimes called quiet shredders). The names relate to how these machines shred the waste material. Impact shredders use blades to cut up pretty much anything so they are great for disposing of branches and twigs. With some of the cheaper models, softer ‘green’ matter such as leaves and weeds can be troublesome and instead of being cut up, this material can stick to the blades and reduce the effectiveness of the shredding action. Impact shredders are the noisiest type and will more than likely require you to wear ear protection. These type of shredders are usually the cheapest. Roller shredders use a different method. They have something that spins around like a big drum. Raised parts on the drum grip and pull the waste in and then it is crushed against a flat plate of some kind. Because of this action, these garden shredders can crush any type of garden waste, but wet or sappy material can get stuck. 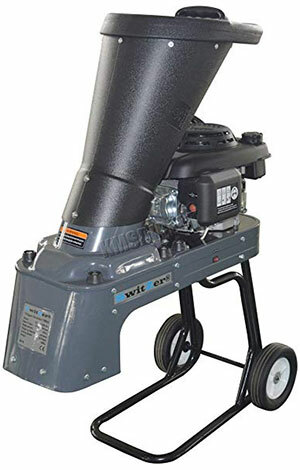 Roller shredders are much quieter than impact shredders but they are also more expensive. 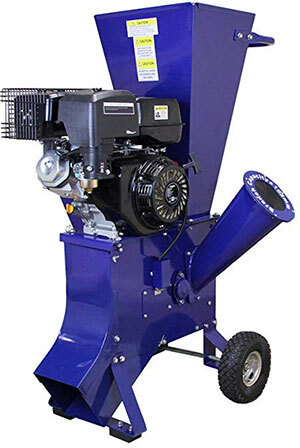 Petrol shredders are by far the most powerful and are generally used for commercial purposes. The vast majority of petrol shredders are larger and heavier than the two types mentioned above but most come with pneumatic wheels so they can be moved around. Petrol shedders don’t need to be plugged into a wall socket so they give better manoeuvrability than electric types. They are the most expensive type to buy and also to run as they require fuel and oil in order tom operate. Now it’s time for some reviews. Let’s start by taking a closer look at a selection of electric shredders. The Bosch shredder AXT Rapid 2200 is a best seller on Amazon and it’s easy to see why. It is fitted with a high speed 2200 Watt ‘powerdrive’ motor that produces 12nm of torque and allows you to pop material through it at a high speed. This motor, along with the laser cut precision blades spinning at 3650rpm and a cutting capacity of 40mm, can manage a material throughput of 90kg per hour. At only 12 kilograms, this impact shredder should cause you no bother when you want to move it around. All you have to do is tilt it back on its wheels and away you go. The light weight does make this Bosch garden shredder feel a little flimsy when compared to other Bosch products, though I guess you have to sacrifice some things for others, and very robust materials tend to be heavy. 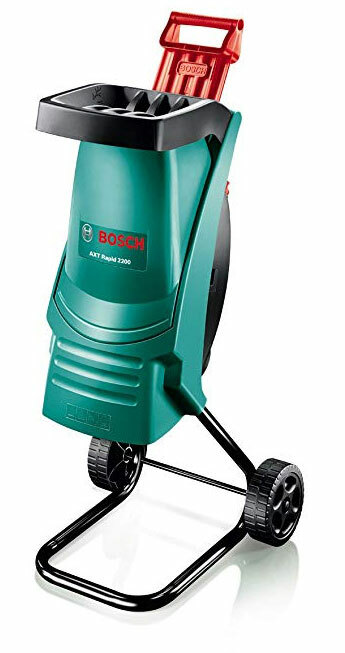 This Bosch garden shredder comes with a wide, practical plunger to help you push the materials through the cutters to speed up the process without getting your hands too close to the large capacity hopper. This machine has a simple design and is very easy to set up and begin using, although hanging up a bag on the provided hooks to collect the shredding was a bit fiddly. Because the exit chute of the machine is at the bottom and quite close to the floor, the collecting bag needed to be shaken every now and then so the material would drop down and not jam the inside channel. Clearing the jam is easy though and only takes a couple of seconds. Simply lift up the top and remove the obstruction. Although the spec says the Bosch Shredder AXT has a maximum diameter of 40mm, I found that it struggled with anything over 30mm and the optimal was around 20-25mm. Still, for an entry level garden shredder that’s not to be sniffed at. It takes a little while to get used to it, but once you get used to how much you should be putting through the machine at a time, you will be shredding to your hearts content. Another negative is some very thin twigs can slip through the blades without being shredded from time to time. Also you will need to take the blade out and sharpen it occasionally to keep up the machine’s cutting prowess. The Bosch shredder AXT rapid 2200 is an entry level, budget machine so of course it will have a few flaws. All in all, it is a nice bit of kit if used correctly and is the best choice for a cheap impact garden shredder. At just under 100 pounds, this impact garden shredder is amongst the cheapest out there. Don’t be fooled by the low price however, as this model has some good features. Power comes from a 2500 Watt, electric motor that runs off 230 volts. This motor powers the cutting blade that spins at 6500 rpm without a load and a still impressive 4500rpm when dealing with a load. Unlike our previous review, this motor runs quiet noisily so you’d better get the ear plugs out. Just like the Bosch AXT, the spec sheet says the maximum width is 40mm but in reality it is more comfortable with 25mm branches. It can handle leaves if you put them through a little at a time but if pushed through in bulk with the plunger, they can clog the machine and it’ll need to be cleared before carrying on. Thankfully, like the Bosch garden shredder, it’s easy to clear. Also like the Bosch, the Dirty Tools garden shredder can let small, thin twigs go through without touching them but it’s not a big problem. A nice feature of this budget garden shredder is the 50 litre collection box that is integrated into the design so there’s no need to fit bags that can be fiddly to fit and easily torn. The box can be easily opened to check how full it is getting at any time. You have to remember to keep levelling the contents of the box out though, or it can block the output chute. This model comes attached with a 6 metre long power cable which comes in really handy and should negate the need for an extension lead unless you have a large garden. After sales service was a bit disappointing and it can be hard to get spare parts when needed. Then again you can always use parts from other machines that will fit if need be. The biggest problem is that the feeder chute is just too small and you need to use the paddle a lot. This slows you down and it just isn’t as efficient as the Bosch garden shredder. Also the blade blunts quickly and needs to be sharpened before each time you use it or it won’t work properly. In conclusion, this offering from Dirty Pro Tools isn’t a bad choice if you’re just using it for light garden work and you have time on your hands. For me, the noisy motor and other flaws make it not as good a choice as the Bosch AXT. So, we’re going up in the price range a little now to see what 400 pounds can get us. Yes, Bosch have done it again, producing a highly efficient garden shredder- the AXT 25TC. The AXT 25TC runs on a 2500 Watt electric motor that has been designed to produce a lot of torque- a staggering 650nm. This torque and the cutting blade speed of 41rpm (rpm rates are lower for non-rotary cutters) makes shredding branches a walk in the park. At only 82 decibels it is one of the quieter models out there and won’t leave you or the neighbours with a headache. This impact garden shredder was specially made to be multi-purpose and can deal with both hard and soft materials. Its turbine cutting system differs from our budget reviews which are both rotary types. The turbine system is highly efficient and can shred everything from soft greenery, to bushes, and even hardwood branches up to 45mm in diameter, the same as on the spec sheet. With this cutting prowess and Bosch’s self-feed system, you should be able to get through 230 kg of material per hour. That’s not the fastest available, but what this machine does is cut steadily and consistently so as to reduce the risk of blocking and, ultimately, save time. At the base of this model, there is an integrated collection box that can hold up to 53 litres of waste and has a built in safety feature where the shredder won’t operate if the box isn’t connected. Like other models, you must remember to empty the box or it can cause the shredder to not work properly. Even with its cutting power, blockages will still occur in this garden shredder from time to time. Bosch has anticipated this and fitted this with a control pad that makes it easy to unblock by reversing it. There’s no need to remove the hopper and this speeds up operating time a lot. The only complaints I have for this particular garden shredder are-. The wheels are small and moving over uneven ground can feel a little unsteady, especially when folded up for easy storage. The plug on the power cord is not a rubberised plug for outdoor use, it’s just a standard indoor type plug. A small fault but I think an important one. Replacement parts are expensive. A new turbine cutting blade costs over 250 quid so you’ll need to be on top of keeping it sharp and maintained. Not without its faults but overall a very capable impact shredder that does what the manufacturers claim and has some nice features that set it above others in the same price bracket. My second choice for electric shredders under 400 comes from well-known brand Makita. Makita are best known for no frills, well built, reliable products and the Makita UD2500 is no exception. 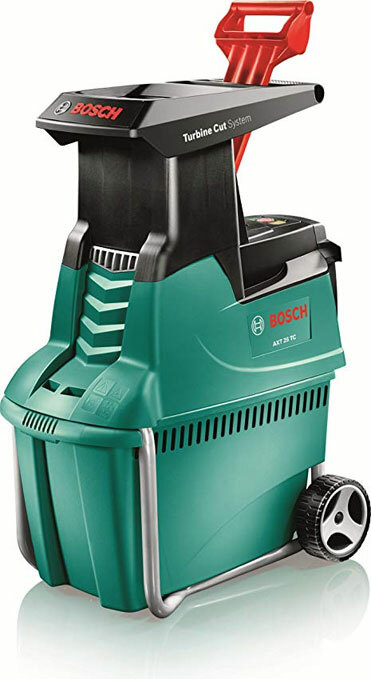 It uses a powerful 2500 watt electric motor like the Bosch AXT 25TC that drives the cut and crush system at 40rpm, effectively shredding branches up to 45mm in diameter. This cut and crush system also helps to reduce the volume of waste material. The motor runs quietly when unloaded and isn’t annoyingly loud when it’s crushing its way through whatever you throw at it. This electric shredder destroys wooden waste very efficiently but can have some problems with wet green materials. The 67 litre collection box sits at the bottom of the garden shredder and has cut outs so you can easily monitor how full it is getting while you work. Again, though, if the box gets too full the shredder will jam. It can also be tricky to fit. There is a reverse function that will clear the blockage effectively by just pressing a button. The Makita’s dimensions are 59 x 42 x 52.5 cm and it weighs 32 kilograms, so it’s too big and heavy to be carried around despite having dual handles. Not to worry though as Makita has fitted the UD2500 with decent rubber coated wheels to get about on, and given it a 10 metre long power cable to make it suitable for small to medium gardens. 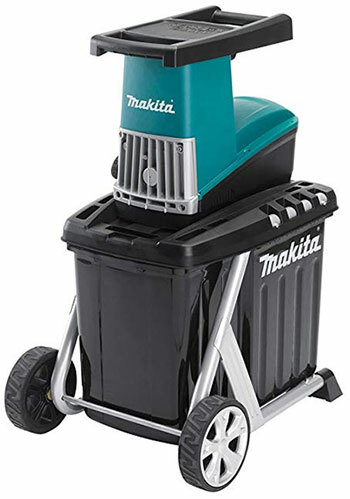 The overall build quality of this electric garden shredder is good (though the safety stop feature feels flimsy) and as already stated, Makita are well known for their durable products and after sales service. Some people have complained that the unit came without the 10 metre power cable, but if that happens, contact Makita and they will send one free of charge. Powerful. Can shred wood easily. Cut and crush system reduces waste. To sum up, this particular Makita garden shredder is very effective when it comes to shredding wood and reducing waste, but can struggle with sappy, wet, or sticky green material. That wraps up our electric garden crusher reviews. Next I’m going review some petrol models. Let’s start with an entry level petrol shredder. 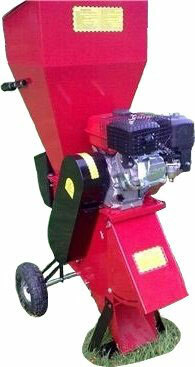 Switzer’s entry level petrol chipper shredder is available for £395.99. That is considerably cheaper than the majority of petrol shredders. Weighing in at 52 kilograms with a full tank of petrol, it is lighter than most too. It is powered by a 159cc OHV four stroke, 5 horsepower engine that can manage 3 kilowatts of power. Enough to comfortably manage jobs that electric shredders would struggle with. The maximum cutting width for this petrol garden shredder is 49.5cm and a cutting blade speed of 3600rpm, ensuring that you’ll be shredding your way through your garden debris in no time. As already mentioned, the switzer heavy duty garden shredder is comparatively lightweight, weighing just 40 kilograms when the 1.2 litre tank is empty. It stands 112cm high, 85.5cm long and has a depth of 42cm, quite compact for a commercial garden shredder. The frame and overall build is good and sturdy and mostly made out of steel. The wheels at the rear of the base could have been better, but the foot stand attached to them that balances the shredder is also made of steel. As with a lot of garden shredders, this model can struggle with green stuff, especially wet or sappy leaves and when a lot of volume is pushed through at once. This will cause the machine to clog up and stop working properly. 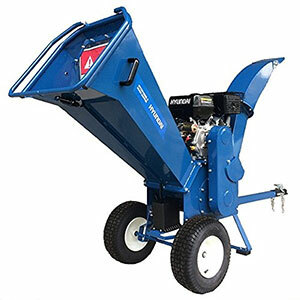 Switzer’s heavy duty garden chipper shredder isn’t a bad choice if you’re on a tight budget. It will smash through most wooden waste without too much bother, but can struggle with leaves in large volume and can clog. Available for £589.00, Titan Pro’s entry level garden chipper/shredder is another viable option for customers with a tighter budget. The engine powering the petrol shredder is a 7 horsepower, 196cc, 4 stroke motor capable of 5.4 kilowatts. The flywheel cutting blade rotates at 2000rpm and the efficient chipping speed of this garden shredder is 26m3/h. This is helped by the safety covered, large brush hopper situated on top of the machine that can handle branches up to 10mm in diameter and also leaves. For larger branches, up to 50mm, there is a side chute to feed them into. The overall feel of this petrol powered garden shredder is one of a good, hard wearing standard and the manufacturers are confident in its durability too. They have offered a full UK warranty and a spares back up service just in case. The majority of its construction is from strong steel and the wheels are large and well-built enough to move this 70 kilogram garden shredder around the garden. The Titan Pro garden chipper/shredder comes with a free toolbox for assembling the product and also free safety goggles and ear protectors. There is an instruction manual but it doesn’t match the actual shredder properly. Titan Pro have admitted that there are faults with it and are currently in the process of updating and correcting it. Another thing I noticed about this garden shredder is the machine vibrates a lot which could shake bolts and things loose over time and needs to be kept an eye on. It also runs quite loudly but you should be ok with the free ear protectors, not sure about the neighbours though. Although let down by a few common faults, the Titan Pro Garden Chipper/Shredder is still a well-built machine that offers good chipping speed. Hopefully, Titan pro can work out the kinks in this machine for their next version as it has potential. Priced at 709.99 it Costs just over 400 pounds more than the Switzer shredder above. So, what do you get for the extra money? Well the first thing is a much larger and more powerful engine. The T-Mech petrol wood chipper is gets its power courtesy of a 420cc, 4 stroke, 15 horsepower engine and there is no doubt that it is designed for large gardens and commercial use. This powerful engine helps to rotate the sharp cutting blades at up to 3600rpm, and the machine can deal with branches up to a massive 102mm in diameter. With this garden shredder, you’ll have a nice clear garden in no time. Not that there’d be any rush to finish. The T-mech has a 6.5 litre fuel tank and 1.1 litre oil tank to keep the machine running for a fair old while before you need to top up either of them. 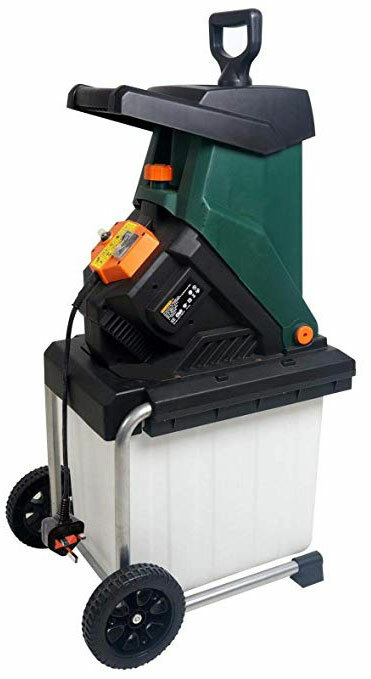 The dimensions of the T-mech petrol garden shredder are 88cm (H) x 64cm (W) x 134cm (D) and it feels sturdy when it is free standing and in operation. Its wheels feel much better than the Switzer model above and shouldn’t give you any hassle moving over uneven ground. There are two places to feed your branches into the machine. One on the top and also a secondary chute lower down on the side of the shredder. A good thing for when you have heavy branches to dispose of as you don’t need to lift them as high. This petrol garden shredder comes with a free tool kit to help you with assembly (which is a two man job if you want to get it done quickly) and also to be used for maintenance. Also included are free safety ear protectors that you will need as the T-mech runs quite loud. The main flaw of the T-mech is that the chippings drop out of the bottom and you need to be on top of clearing them away before they pile up to high and end up clogging and jamming the machine. With a powerful engine, good maximum cutting width, free accessories and double feeding chutes, this petrol garden chipper/shredder is worth investing in and only let down by the operating noise. Here are a couple of reviews for people with deeper pockets. The Hyundai HYCH 1500E2 costs 1,569.99. Is it worth it? Well, read on and I’ll give you the facts and you can make up your own mind. Let’s start with the engine. Coming from a well-known car manufacturer, you know than you can trust in this engine to do the job. It’s a 420cc, 14 horsepower, 4 stroke device that is designed to provide a lot of chipping power and also to last a long time doing so. This product comes with a 3 year warranty and full spare parts service. This Hyundai petrol garden shredder is started via an electric key start powered by a 12 volt battery to ensure that it starts up first time every time. Cheaper models tend to use a pull start system that can sometimes be problematic. The cutting system is an excellent 2 blade drum mechanism that draws in branches up to 85mm and turns them into woodchips like it’s a walk in the park. The chippings are ejected from the 180 degrees rotating chute, so you can spread them in multiple directions or load them straight onto the back of a truck to be taken away. Although this garden shredder is on the heavy side at 180 kilograms, the dual handles and very large and wide pneumatic wheels make it manoeuvrable enough. It is also fitted with a tow bar so you can pull it along with an ATV or ride-on lawnmower. This is an easy to use machine, with user friendly features such as the easy twin v-belt tensioning, removable tow bar, toolbox and bearings that are easily lubricated. It comes with a free toolbox and there is built-in storage for it on the main unit. The only complaints I have about is that it was awkward to fill with petrol because of the fuel cap and I noticed some exposed wiring that may cause problems if debris catches on it after prolonged use. Possessing attributes such as a durable engine, powerful cutting prowess, great build quality and some other nice features, the Hyundai HYCH1500E-2 is perfectly suited to large gardens and commercial use. Titan Pro’s Beaver petrol Garden Shredder costs a whopping 2,150 pounds, making it the most expensive model we will review today. Like the Hyundai HYCH, it is intended for heavy home use or commercial gardening. The Titan 420cc, 15 horsepower, OHV 4 stroke engine gives this garden shredder its heavy-duty performance. Power is transferred by heavy duty twin belts that help to prevent shock loadings to the crankshaft. The engine can be started one of two ways. There is a traditional recoil system and now also a new electric key start option. That’s a nice feature because if, for whatever reason, one of the starting methods breaks, you can still use the other. The twin, hardened steel, 30cm reversible cutting blades and revolving drum mechanism make light work of hardwood branches and it has a maximum chipping capacity of 100mm. 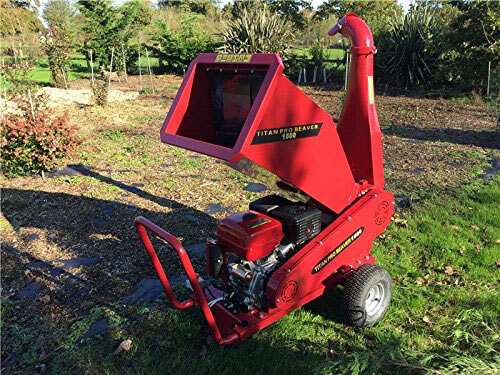 unlike a lot of chipper/shredders, the Titan Pro Beaver doesn’t get clogged up with sappy leaves or Leylandii and instead shreds and mulches them in bulk creating nice compost. At 160 kilograms, this is no lightweight machine but with that extra weight comes the durability of hard-wearing materials. Also the Beaver garden shredder is fitted with a sturdy axel and large bearing pneumatic tyres which work well to handle the weight. The Titan Pro Beaver petrol garden shredder also comes with a tow bar. Chippings and shredding can be spread around to fertilise the garden wherever you choose, or just loaded straight into a tipper truck, wheel barrow or other container thanks to a rotatable chute, just like the Hyundai model above. I don’t have too many bad things to say about this garden chipper/shredder as it performs well at all tasks. I guess the only thing holding it back is the hefty price tag and the fact that it’s a heavy duty shredder means that it’s always going to be loud. If you’ve got deep pockets and a lot of garden debris to shift in a hurry, the Titan Pro Beaver chipper/shredder might be for you. It really does perform well on all kinds of waste. From hardwood branches to twigs and sappy leaves, this garden shredder will handle it all. That brings us to the end of this article on garden shredders. So what have we learned? Well firstly, garden shredders can save us valuable time that would otherwise be spent driving to and from the tip or chopping up material. Using one to dispose of garden waste is better for the environment than burning it on a bonfire and won’t asphyxiate your neighbours. Mulching plant waste, as well as food waste can make great compost for fertilising your soil. Electric garden shredders are cheaper than petrol models, and impact shredders are generally cheaper than the more effective roller type. Petrol lawnmowers are the most powerful but also the most expensive and noisy. Not clearing out the collection box on a garden shredder will most likely cause it to get backed up and jammed. You must wear eye and ear protection when using any garden shredder. I hope that you found the information we shared today helpful and have a better idea about all things to do with garden shredders, their types, benefits and flaws. We also have similar articles, with reviews of all kinds of garden equipment on this site such as lawnmowers and pressure washers. Please take a look when you have time.